If you're flying in and out of Toronto, then Toronto airport hotels are your best option for accommodation. The hotels near Toronto airport allow you to save money and offer great convenience and flexibility. Staying at the Toronto Pearson Airport hotels is especially beneficial to you, if you are flying to Toronto for a business trip or have an early morning flight out of Toronto Pearson Airport. Contrary to common belief that most hotels near an airport are bound to be shoddy, Toronto airport hotels feature many of the biggest, best and most highly regarded names in the industry, offering travelers some truly great options. You'll notice that Toronto airport hotels usually offer cheaper rates than most of the downtown Toronto hotels. So you can find a hotel that's right in your price range and offers you all of the amenities that you're seeking. Moreover, you can be right next to the Toronto airport which means a minimum of hassle, downtime, extra traveling time or potential for problems due to traffic and other delays. Don't add more travel, expense and headache to your trip, stay next to the airport, maximize your time and get the best of both worlds with Toronto airport hotels. 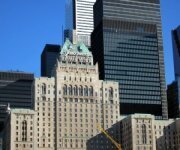 Below you'll find reviews and more information regarding some of the best and most popular Toronto airport hotels. From Sheraton to Hilton, Westin to Marriott, you are bound to find a great match for your own needs. Sheraton Gateway Hotel is the only hotel located literally in the Toronto Pearson Airport. With direct, indoor access from Terminal 1 and 3, it's one of the best pick among the Toronto Airport hotels. The hotel features flight check-in kiosks, large departure and arrival screens in the hotel lobby for your convenience and comfort. There are three types of rooms - including Traditional and Deluxe guest rooms, Sheraton Club rooms and Luxury Suites. All of the guest rooms are spacious and comfortable and feature Sheraton Sweet Sleeper Bed providing much needed respite after long, stressful journey. Most of these rooms offer spectacular views of the airport and at the same time triple thermal windows allow you to block out the noise of the airport and all of the hustle and bustle. For your business needs, the hotel offers excellent meeting facilities, equipped with the state-of-the-art audio-visual and computer technology. Check out the 24-hour modern fitness centre or take a dip in the indoor heated pool. The Westin Bristol Place is one of the finer and more luxurious options for Toronto Airport hotels. It's a quick five minutes from the airport and complimentary bus service is provided. This is an amenity-filled hotel, allowing you to escape the stress and hassle of traveling. The hotel offers comfortable and energizing accommodation in well-appointed, smoke-free guest rooms. Enjoy the Westin Heavenly Bed, Heavenly Bath, high speed internet and more in large guest rooms. You can relax and unwind in a great indoor pool or work out in the huge and modern WestinWORKOUT Gym. The hotel also features a highly rated restaurant, Zachary's, offering delightful cuisine in an elegant ambience. The hotel offers large space for corporate meetings, events and conventions. Whether you are travelling for vacation or business, the Toronto Airport Marriott Hotel is a perfect hotel located only minutes from the Toronto Pearson Airport. The hotel offers spacious guest rooms and lavish suites with standard Marriott amenities and features. You will find comfortable beddings, an ergonomic desk and a work chair in the rooms. The hotel has fitness centre equipped with cardiovascular instruments and weights. There is also an indoor swimming pool and whirlpool where you can chill out. If you are planning for a business meeting or event - big or small, Toronto Airport Marriott hotel offers everything that you need for a successful event including large event space, professional event-planning services, advanced audio-visual equipment and high-speed internet. The hotel is located close to International Centre and Toronto Congress Centre. And as other Toronto airport hotels, Toronto Airport Marriott also provides complimentary airport shuttle service. The Hilton Toronto Airport Hotel and Suites has been fully renovated to provide improved comfort, luxury and choices for travelers. It's located directly across the Toronto Pearson Airport but manages to avoid the flight paths, which provides you with a great, quiet night's sleep. In addition, you'll be able to take advantage of complimentary 24-hour shuttles to and from the airport. The hotel also offers large parking area which makes it worthwhile option to park, stay and fly. For your accommodation, you can choose from 419 elegant guest rooms including King, Double Queen, King Deluxe, King Junior Suites and Executive Floor rooms. All of the rooms and suites feature wide array of amenities. You will find yourself close to many big business firms - both local and global. Also, hotel offers excellent business centre, conference and meeting rooms with audio-visual equipments and high-speed internet access, making it a great Toronto airport hotel for business. You can also enjoy complimentary access to a recently modernized fitness room, an outdoor heated swimming pool and a squash court. A comfortable and modern hotel well-located close to Toronto Airport, the Hampton Inn & Suites Toronto Airport is an excellent pick among Toronto airport hotels. The hotel features 200 spacious and plush rooms and suites to relax and stretch your legs. All rooms offer great amenities to make your stay pleasant and perfect. You will find free high-speed internet access, lap desk and comfortable Hampton Bed. The indoor heated pool and fitness centre offer great ways to unwind and keep in shape. Every morning you can enjoy complimentary, hot buffet breakfast served at On the House. There is no onsite restaurant for lunch or dinner. However, you'll find many great eateries in the vicinity of the hotel. The hotel also offers decent business and meeting amenities. If you are looking for clean, cosy, convenient and cost-effective accommodation close to Toronto airport, the Fairfield Inn & Suites Toronto Airport is perfect hotel for you. Located just 3 minutes from Toronto Pearson Airport, the hotel offers free 24-hour direct airport shuttle. You will be impressed by large and modern guest rooms and suites. All rooms feature free wireless internet, executive work desk, microwave, mini fridge and much more. The Fairfield Restaurant and Lounge is open for dinner every day and serves international cuisine. The complimentary continental breakfast is perfect way to fire up of your day. You can relieve your stress and energize yourself at indoor swimming pool, hot tub and fitness centre. Hilton Garden Inn Toronto Airport is one of the newly opened Toronto Airport hotels, located conveniently just minutes from the Toronto Airport. With 224 outsized guest rooms, fitted with state-of-the-art amenities and services, you will not miss the comfort of your home. All rooms feature LCD TV, refrigerator, microwave, coffee maker, comfortable and adjustable bed, ergonomic chair and work desk. You can take the advantage of the complimentary wired and wireless high-speed internet service in guest rooms as well as the public area. For an amazing dining experience, check out the Great North American Grill Restaurant. The hotel also has the stylish Pavilion Bar and Lounge where you can sit back, enjoy and relax. For your fitness and recreation, there is a modern fitness centre, indoor swimming pool and whirlpool. The hotel offers great business facilities and meeting space, complimentary airport shuttle service and huge indoor and outdoor parking space. Whether you are travelling for business or leisure or looking for park, stay and fly option, the hotel will surely meet and surpass your expectations. Located just minutes from the Toronto Airport, Holiday Inn Toronto International Airport is very convenient and comfortable hotel. The recently renovated guest rooms are large and clean, with relaxing bed, heated bathroom floors and complimentary Wi-Fi internet. After a stressful journey, you can relax and refresh at the heated indoor and outdoor saltwater pools and hot tub. Or workout in the state-of-the-art fitness centre. Visit the Metropolitan Restaurant and Bar for freshly made, fantastic cuisine and wide range of wines and martinis. With close to 21,000 sq. ft. of event space, Holiday Inn Toronto International Airport is just ideal for business meetings, conferences and tradeshows. Also, it's close to Toronto Congress Centre and International Centre. Overall, it's a great place to stay for business or leisure or simply an overnight stay prior to morning flight - with free Toronto Airport shuttle. Giftedly located right across from Toronto Pearson Airport - Terminal 3, the Four Points by Sheraton Toronto Airport provides a top-notch hospitality and great service in a relaxing environment. The smoke-free guest rooms feature a wide range of amenities. You'll find a comfortable bed, ergonomic chair, work desk, complimentary high speed internet and more. The hotel features an indoor heated pool, hot tub and fitness centre to relax and rejuvenate after a day of hectic traveling. Visit DeMaple Restaurant and Lounge for flavoursome food and a yummy cocktail. Or you can unwind in beautifully decorated, dazzling lobby. If you are planning to host a business meeting or conference, the hotel offers excellent facilities with free wireless high-speed internet and modern audio-visual equipments. For your convenience, the hotel offers free 24-hour shuttle to and from the airport. The Courtyard by Marriott Toronto Airport is a great place to lay your head, close to the Toronto International Airport with a free shuttle service to and from the airport. You can enjoy your stay in one of the 168 spacious and comfortable guest rooms. The rooms features a large work desk, an ergonomic chair and complimentary wireless high-speed internet. Try the hearty buffet breakfast in the Courtyard cafe, or you can buy brand name produce from The Market located in the lobby. The hotel features a heated indoor pool, Jacuzzi and fitness club. You can also spend some time and relax at the large outdoor patio. The hotel is just minutes from several corporate offices, and there are 2 meeting rooms for your business needs. Spacious and comfortable suites, convenient location close to Toronto Airport, complimentary airport shuttle service, great stay and fly package - Quality Suites Toronto Airport has it all. It's the closest among the pack of all-suites Toronto Airport hotels, located just minutes from the airport. All suites at this hotel offer separate living room and bedroom, ideal for a small family. The suites are equipped with king beds, sofa, coffee maker, dining table and chairs. Free high-speed internet access is also available in the suites. You can savour the tasty Italian cuisine at the on-site restaurant, Graffiti's Italian Eatery and Saloon. The hotel offers exercise room and small to mid-size meeting rooms that can accommodate up to 120 guests. If you are looking for stay and fly option, this hotel offers amazing deal on stay, park and fly package. Hotel Indigo offers unique experience with its contemporary but unusual decor and top-class amenities. Conveniently situated near the Toronto Pearson Airport, it's reasonably good place for a stopover at a reasonable price tag. The hotel offers 120 guest rooms and suites featuring hardwood floors, a spa-inspired shower, and a large work desk with an ergonomic chair. You can relish delicious food at Phi restaurant. The hotel also provides excellent business facilities with two modern meeting rooms, high-tech audio-visual equipment and free Wi-Fi internet. You can take the advantage of the park, stay and fly package offered by the hotel. Park your car at the hotel when you fly, with complimentary shuttle service to and from Toronto Airport. Carlingview Airport Inn is an inexpensive hotel near the Toronto Airport, suitable for a stopover or a short stay. If you have to pick early morning flight next day, the hotel is an ideal choice for you. A complimentary 24-hour airport shuttle service is available. The recently renovated hotel features 112 spacious, clean and fresh guest rooms with free wireless high-speed internet access and many other decent amenities. You can enjoy a free continental breakfast, coffee and tea in the morning. The hotel also features a small meeting room for seminars or board meetings. With a reasonable price and great convenience, this 2-star hotel provides good value for money. Being one of the few 4-star Toronto airport hotels, Sheraton Toronto Airport Hotel & Conference Centre offers comfortable and luxurious accommodation in a resort like surroundings. There are 249 beautifully decorated, well appointed guest rooms for your comfort. The spacious guest rooms features a work desk, ergonomic chair and Sheraton Sweet Sleeper Beds. Complimentary wireless high-speed internet access is available in the lobby and other public areas, however, you have to pay additional charge for internet access in guest rooms. Check out the atrium-enclosed swimming pool. It's nice and huge. Or work out in 24-hour fitness centre. Relish the lip-smacking Mediterranean cuisine at the exquisite Olio Restaurant and Lounge. The Sheraton Toronto Airport Hotel & Conference Centre offers state-of-the-art meeting and event amenities including 26,000 square feet space, high-speed internet access, modern audio-visual equipment, projector and much more. With convenient location near Toronto Airport, outstanding customer service and excellent amenities, this hotel gives you excellent value for money. The Sandman Signature Hotel Toronto Airport is another nice hotel for stay, park and fly. Conveniently located 2.5 km from Toronto Pearson Airport, the hotel offers complimentary shuttle service to and from the airport. Toronto Congress Centre is also just minutes away from the hotel. The hotel offers variety of guest rooms and suites to meet your accommodation requirements. The rooms are clean, spacious and well equipped, with soft and comfortable beddings, free high-speed internet, thermostat, fridge, microwave, designer bath products etc. Many of the guest rooms offer a dazzling view of the Royal Woodbine Golf Club located adjacent to the hotel. Visit the state-of-the-art fitness centre, if you wish to maintain your fitness routine. Or relax at the heated indoor saltwater pool and spa tub. You can enjoy mouth-watering food at the Moxie's Grill - a very popular restaurant and lounge. The Residence Inn Toronto Airport hotel, located only few minutes from the Toronto airport offers excellent accommodations and outstanding customer service. If you prefer ample space to relax, this is the perfect hotel for you. The hotel offers all-suite rooms, which are 50% larger than standard hotel rooms. The suites are equipped with full-fledged kitchen, dining and living area, and complimentary high-speed internet access. You can also find lots of actions outside your suite with an indoor swimming pool, well-equipped fitness centre and outdoor basketball court. You can enjoy a variety of complimentary services and amenities, including free high speed internet, a free hot buffet breakfast, and free 24-hour direct shuttle to and from the airport. The hotel has earned reputation for exceptional services and facilities and the only way for you to endorse that view is to experience it in reality! The DoubleTree by Hilton Toronto Airport is located few minutes from the Toronto International Airport and across the street from the Toronto Congress Centre. The hotel has recently upgraded many of its features and amenities. This includes LCD TV, wireless high-speed internet in all the guest rooms, public areas and meeting space. The guest rooms and suites are large and pleasant, but somewhat outdated. If you need to work, you will feel comfortable with outsized work desk and an ergonomic chair. The hotel has a lovely indoor pool with two huge waterslides and a hot tub. You can work out in the modern fitness centre. If you stay at this hotel, you won't go hungry. With four on-site restaurants, each serving different flavours around the world, you will find something to treat every taste bud. The hotel has excellent business and meeting facilities. The event space is large and flexible - suitable for small business meetings to large conferences, seminars and trade shows. The Crowne Plaza is another one of the Toronto airport hotels in the immediate vicinity of the airport, just a few minutes away, and offers 24-hour complimentary shuttle service back and forth. The business-friendly hotel is ideally located near Toronto Congress Centre, the International Centre and Pearson Convention Centre. You can also access large meeting space, a business centre and free high-speed internet. The hotel was recently renovated in 2008 and has nearly 500 tastefully decorated guest rooms fitted with all modern gadgets and accessories for matchless comfort. You'll also find a health and fitness center, indoor pool, sauna, whirlpool and other add-ons providing you everything you need as you're heading out, coming back or stopping over for a trip. For a great meal at any time of the day, you can visit La Brasserie Restaurant, offering scrumptious cuisine by award winning executive chef Tony Fernandes. Brilliantly located just steps away from the Toronto Congress Centre, the Radisson Suite Hotel Toronto Airport is a perfect hotel for business or leisure stay. This is an all-suite hotel and features spacious suites with a separate living room and bed room. You will find complimentary high-speed, wireless internet, oversized work desk, mini fridge and other convenient amenities. The hotel features a wide array of services including 24-hour free airport shuttle, 24-hour business services, well-equipped fitness centre, concierge services and parking with in-out privileges. The hotel has an on-site restaurant, the Fox Bistro, where you can relish variety of international dishes in quiet and comfortable atmosphere. The restaurant is open for breakfast, lunch and dinner. The hotel also offers versatile space and handy services for a business meeting, seminar or workshop for a group of up to 50 people. After extensive renovation, Holiday Inn Toronto Airport East now greets the guests in fresh and fabulous ambience. Like other Toronto Airport hotels, this hotel is also located close to the airport and major highways, and offers free shuttle service to and from Toronto Airport. The guest rooms and suites are clean, comfortable and large ensuring relaxed and enjoyable stay for you. You will find floor-to-ceiling windows, comfy bedding and separate work desk with chair. Free high-speed internet is also available in guest rooms so that you can stay connected during your stay. Perkins Family Restaurant is an excellent place for breakfast, lunch or dinner. The on-site restaurant is popular for all day breakfast and extensive menu offers something for everyone. After a hectic journey you can relax and enjoy at the heated indoor swimming pool or work out in the fitness centre. With seven meeting rooms, modern equipments and professional staff, the hotel is a perfect place to host business meetings, conventions and events.